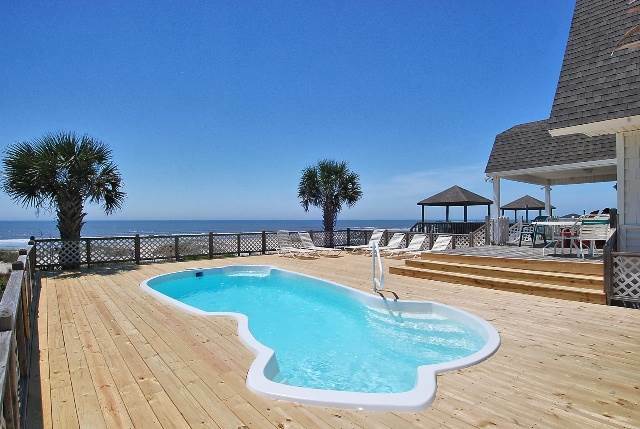 A landmark on the beach, affectionately known as "The Barn" - this oceanfront home boasts 8 Bedrooms, 7 Baths, with charming knotty pine throughout open living areas. Hardwood floors throughout, 51" flat panel TV in the living room, 4 televisions, 2 DVD players, Blu-ray player, Wireless Internet Access, Gourmet Kitchen including an expansive granite prep and dining bar with 8 bar stools, 2 dishwashers, washer/dryer, microwave, stand-alone ice machine, two refrigerators in kitchen and a third refrigerator on ground level. This home has a charcoal grill, spacious oceanfront decks with fabulous ocean views and oceanfront heated swimming pool (12x25). Minimum time for pool to be heated is for the length of your stay or at least 7 days whichever is less. (Sept – May for $100/day). Non Smoking. NO PETS Sleeps 22 in the following bedding configuration. Lower level: Queen, Single/Single Main: Double/Double, King, King Upper: King, Queen/Queen, Double/Double. Full linen service included with your stay! All beds will be made, and bath towel sets for 22 will be provided. We searched for a home to accommodate our extended family for a post holiday getaway. The Barn was a great choice for us! With 8 bedrooms and 7 bathrooms it gave everyone in our group their own space, yet the kitchen and living space was large enough for us all to be together for meals, games and lots of laughs! The home was clean on arrival. Small issue with lightbulbs was resolved quickly. Pool and deck areas were well maintained. We all loved sitting out enjoying the pool, beach and gorgeous sunsets! I would definitely rent this property again. My family enjoyed so much our stay for Thanksgiving 2015. The house was perfect. We loved the kitchen and the beautiful porch and deck, seeing the sunrise and also the sunset. The wide beach was great for bicycling and the view spectacular. This is the second year our group stayed at this home for our golf outing in april. Our golf vacation to North Carolina started in 1990 and we have never missed a year. We named the vacation the 'Marrty Memorial' after an individual that passed away in 1993. We have stayed at different houses on Carolina Beach, Sunset Beach and Ocean Isle Beach, but this house is our favorite. It is nostalgic and yet it contains all the amenities of a newer vacation home. We have reserved this house for next year and we look forward to enjoying this beach front home. By the way, golf has become the least important feature of our vacation. There are usually 7 or 8 of us 'Martys' that participate each year. The house is ideal with 8 bedrooms aned 7 baths. See you next year. Q: Does the house have central air conditioning? Yes, the house has central air conditioning and heat.